I love our old barn, it’s the main reason we decided this was the place my husband & I wanted to settle in and start our new life. Many people have asked about the beautiful old barn so c’mon in – join me for a tour! 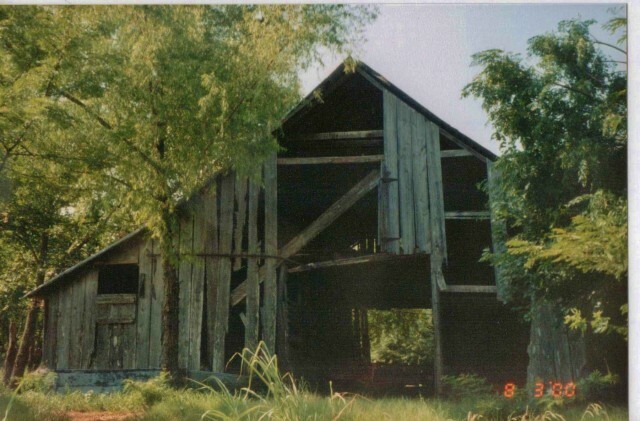 This is what our poor barn looked like when we first purchased the property in 2000. It had been neglected for decades and we knew we had to do something to save it. Although the outside was crumbling, thankfully the inside was solid. We hired a contractor to come strip the exterior boards, repair parts of the skeleton and replace the exterior with similarly-styled lumber. To keep the patina I love we allowed the boards to age for 1 year before we sealed them to protect them from the elements. The front of our barn is the main entrance. It’s roughly divided into 3 parts – the open manger / roost area on the right, the main runway in the middle with separate rooms and pens on each side and a long storage area to the far left that extends the entire length of the barn. 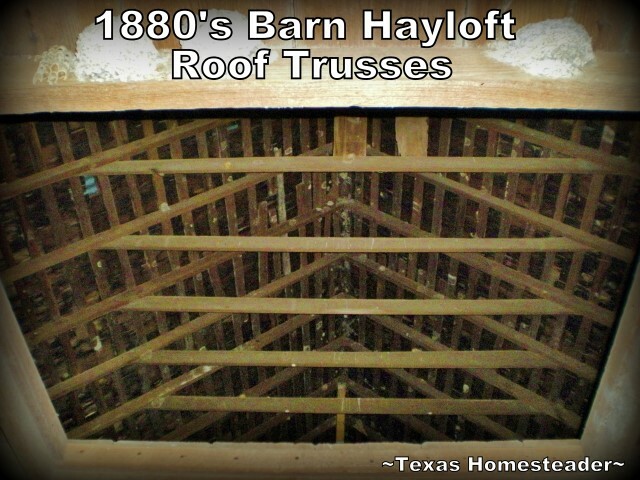 The hayloft doors at the top allow for dropping hay from the 2nd story hay storage area. This is the manger area that shows on the right side of the barn. We exposed the posts by removing the old rusted tin and rotting boards that were nailed to the sides – I like it much better this way and the cows use it as a loafing area. There are 3 of these holes cut roughly from the 2nd floor hay storage area into the manger area. I’m guessing they were used to drop hay for feeding the animals in the manger. The chicken roost area is closed in at the back end of the manger side. This little door has old steps that lead up to it. Now onto the middle section of the barn. The picture below is looking down the main middle run of the barn. I Love the detailing! This room with semi-open walls on one side is interesting. The hayloft ladder is just to the right. This view is looking up the ladder to the hayloft area. You can see part of the massive roof structure from this angle. In the middle of this runway ceiling is a huge hinged door directly on the hayloft floor. I’m assuming this is to bring the hay bales up to the hayloft from the wagons. It’s also a great shot of the roof trusses. I love the barn swallow nests too. I found an old set of chains that still hang inside. I’m not sure how long they’ve hung here but they had been here quite a long time when we found them here 13 years ago & left them as we found them – I think it adds an old-time charm. Looking to the right side of this main runway we see what must have been an animal pen that extended about half the length of this space with two small pens enclosed on each end. I love all these old Bois D’Arc posts and have no doubt they came from this property so many years ago. Here’s a view of the large side pen. There were some hand-made mangers in this pen originally but sadly they were way too far gone to save so we removed them. This is one of the two small pens on either side of the larger animal pen. There are a total of three of these old handmade doors that were used in this area. They’re very heavy and I love them! 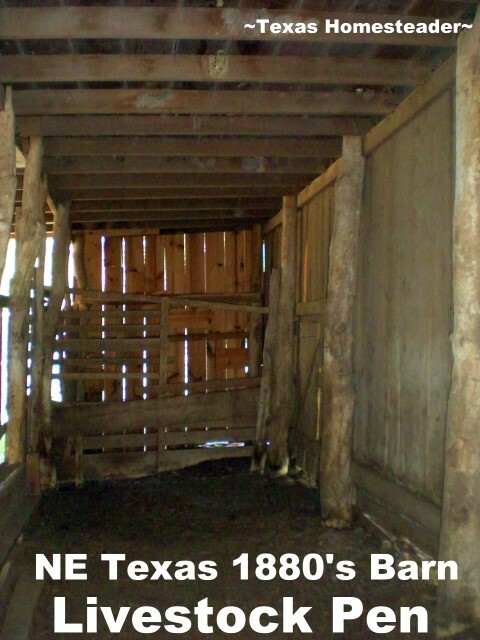 When we made repairs to the barn, we left the inside as untouched as we could. I love this old heavy hand-made door and the baling-wire-latch system they used. How do you like the place so far? Join me tomorrow to finish touring our old barn here! 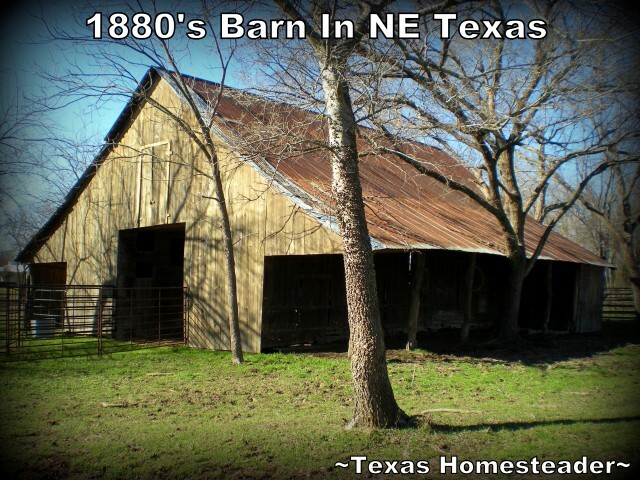 Love Our 1880’s Barn? See More! 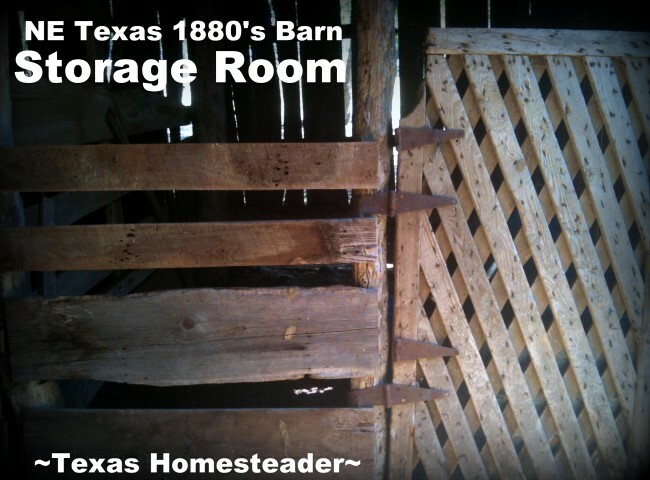 This entry was posted in Blog Posts and tagged Barn, Ranch Life on March 11, 2013 by Texas Homesteader. I love this barn! it reminds me of my grandfather’s barn and farm. Thanks so much for sharing with us at Merry Monday. I die! This is an amazing barn! I am kind of obsessed with old barns. This one is to die for. Thanks for sharing at Merry Monday! What an amazing barn! I love how you allowed the wood to age for a year before you sealed it to keep the old fashioned look of it! Hubby would be drooling at the hay areas as we don’t do square bales for lack of weather protection. We do lots of the round bales (but I would see a square baler in our future if that was the case!)…. But one day… perhaps we can create something similar. That is a dream of ours. In the meantime, we are happy that at least our animals have small areas for protection. Thank you for sharing your wonderful posts with us on the Art of Home-Making Mondays at Strangers & Pilgrims on Earth! That’s awesome that the inside was in such good shape compared to the outside. Thanks for sharing your Barn TMH, Many nice comments about it from others. Wonderful pics, they take me back to my younger days living in Montana, Haying the summers as a teenager loading up many barns with bails and seeing how they were built. Great Idea with saving the patina of this structure, I wish I could look back in time and watch it being built. Oh the stories this Old Barn has to tell if we could just somehow hear them. looking forward to next entry about your barn. Love, love old barn pictures. Yours is beautiful. Thanks for sharing. Your barn is just so amazing! I’m so glad you kept so much of the history with it. It reminds me of the barns that sat on my grandparents property. We would spend hours playing in there as kids. Thanks for the tour and I can’t wait to see more! so very cool. i am glad you took the time and money to refurbish this barn. so mny loving hands have touched it over the years. 🙂 thanks for shaing. This is a ratty looking load of hay on a set of hay ladders – the wagon platform had a 12″ wide ladder that was about 6 foot high,mounted securely in the center of the front of the wagon.- it was there to help stabilize the load of hay and prevent it from sliding foreward onto the team,when you were going downhill and also enabled you to climb up onto the load. You had to step up onto the wagon tongue and then up onto the wagon body. Hay could be pitched onto the wagon with a long handled 3-tine hay fork or dumped onto the rear by a mechanised “Hay Loader” that you pulled behind the wagon. If you used a loader,you had to use a “side rake” to rake your hay in windrows so the loader could pick it up. I may have a picture of one of our hay wagons in my parents album. I’ll have to check. I was born in 1936 on a Pennsylvania farm.All of my parents relatives were farmers. 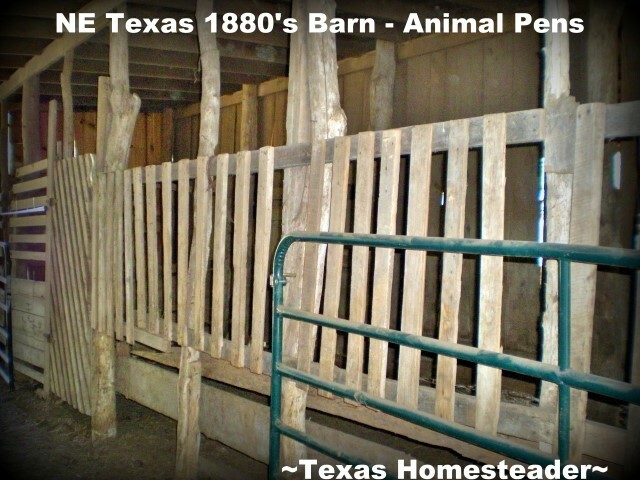 This was a fertile area and most farms were 100 – 250 acres,so the barns were large. Hay balers were not available until the 1960’s so all of the hay was made “loose” and a set of hay forks were used to lift 2-300 clumps of hay off the wagons and dump it in the mows,where it was spead by hand – a hot dirty job in July and August.If this was used in your barn,there will be a set of metal tracks running length-wise under the roof ridge. If you put “green” hay in an enclosed area,it will heat up and spontaneous combustion will start a fire and burn your barn down – so there were lots of ventilation access points in the upper part of the barn. 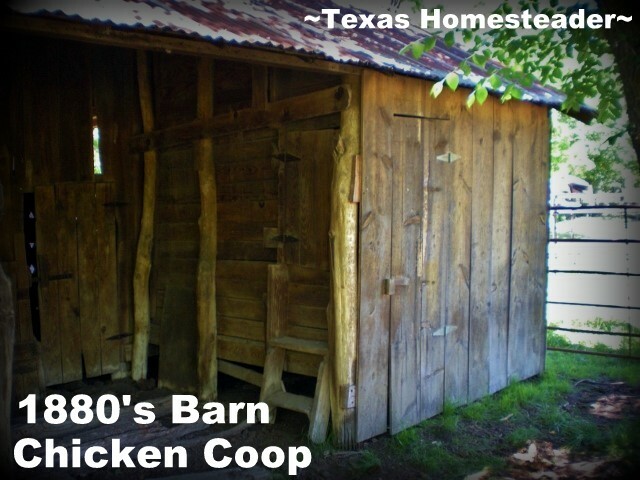 Around here,chickens were not kept in the barn – they were kept in their seperate chicken coop where they alos had a fenced-in “run”. The only livestock that were kept in the barns were cattle and horses. All barns had a granary where oats and wheat was stored. The oats granary was usually over the horse stable area so the daily ration of oats could be dropped into the horse mangers. if it was a dairy herd,there would be rows of stanchions or neck-chains to hold the cows while they were being milked. What led me to your beautiful barn? I am half way done typing my transcription of my great-grandfather’s 1882 diary. He was a farmer and cattle raiser in Fairfield County, Ohio. I was looking for pictures of hay ladders to include with the finished book. Some neighbors had come over to borrow one of his hay ladders to haul wheat on. Still have no idea what I’m looking for that would fit the bill, but your beautiful barn is the my idea of what his barn must have been like. It’s gorgeous and your restoration is a good job, well done! BTW, I am an 83 year-old widow living in SE MN, which is corn and soy bean country. A cow or horse around here is a welcome sight. Thank you for making his diary come alive. What a gorgeous barn and lovely photos! It is stunning. I love it and you should at least get a few chickens. They are the most wonderful things and really very easy. Wonderful work….and how admirable that you want to restore this lovely barn to its former glory. I love it!! They’re all beautiful captures, but I really love the 4th image… sunshine, green, flowers, blue sky, fence, rusty roof & the barn itself all blend together for a beautiful image! 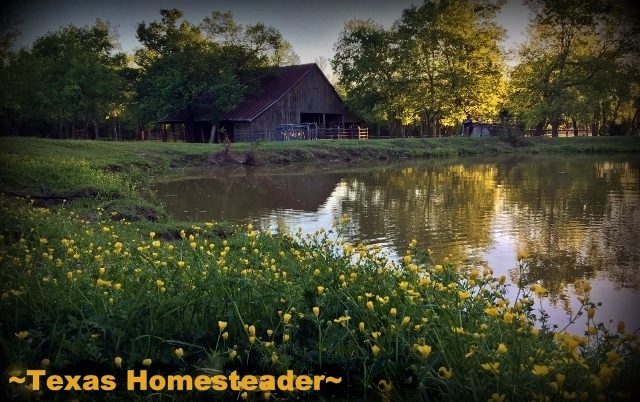 Thanks so much for the virtual tour & for sharing on Barn Charm! 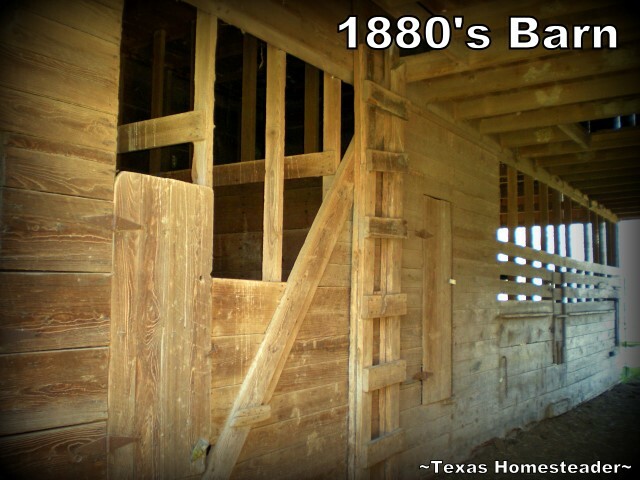 You did a wonderful job restoring this barn. Thanks for the tour! I thoroughly enjoyed it! I loved the tour of your barn. You’ve done good! Love, love your barn! So glad you were able to repair it. I have always enjoyed physically walking in and/or quietly sitting in very old buildings and letting my mind wander and wonder about the people who have been there before. 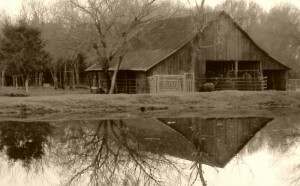 Older buildings – and barns – are usually so peaceful! Thanks for sharing! What a beautiful barn! I’m glad you were able to save and repair it. The new ones just don’t have the character and charm the old ones do. I love all of your posts and pictures and the barn ones I really like, this barn looks so much like the one my greatgrandmother had in Arkansas. Her husbnd had a huge sawmill and in the barn they kept their mules they used to haul the wood…and even as a kid it still smelled of old leather and horses even though they had not been there for quite a while..and of course there was the chicken coup just like yours and as a small child I was scared to gather eggs and I remember them loading hay into the loft with a pulley system and we of course as kids played in the bales making forts and hiding places…such wonderful memories I hope you keep posting and adding pictures!!! thanks again!!! Oh this is wonderful. I’m so glad you repaired it instead of tearing it down and building a new one. I love old barns. I just had to pin this on pinterest on my “Barns” board. What a wonderful old barn. It turned out great !! Thank you for sharing.